Let’s take a trip down under with some fun Australia activities for kids. We’ll explore through crafts, books, recipes, and other learning activities. It’s always so much fun to another country and since we can’t always travel to all the places in the world, doing a geography and cultural exploration at home is the next best thing. We loved learning about Australia so much for Project Around the World, that we did a few extra projects we found on other blogs. One project just wasn’t enough. 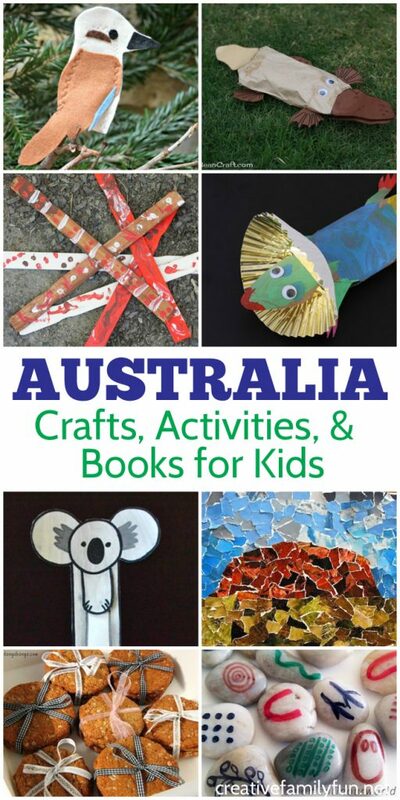 Luckily, there are a ton of great crafts, activities, and recipes that you can do with your kids for your at-home exploration of Australia. Check out all the great ideas I found below. Create an Australian flag. Danya Banya has a fun version for your kids to make. Make the Sydney Opera House out of paper plates using this simple tutorial from Danya Banya. Explore Australia through smell with some Calming Eucalyptus Play Dough from The Imagination Tree. You can also explore the scent of eucalyptus with this colorful and scented sensory rice play idea from Laughing Kids Learn. Build the Sydney Harbour Bridge with this simple craft from Danya Banya. Make a torn paper collage picture of Uluru (Ayers Rock). Find out how to make your own at Kid World Citizen. Use a fun printmaking technique to create fun bottlebrush flowers artwork. Danya Banya has the instructions for this fun technique. 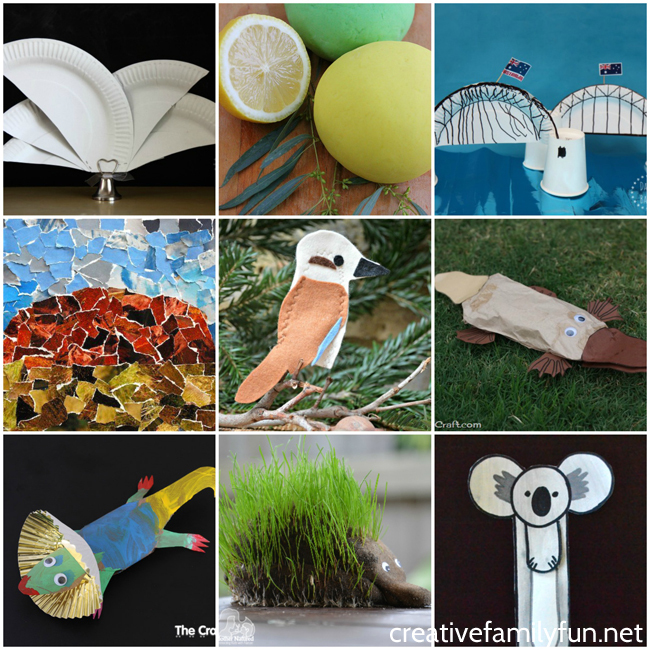 Make a felt kookaburra finger puppet. Red Ted Art shows you how to make this simple sewing project. Make an adorable paper bag platypus like these from Cook Clean Craft. Use a cardboard tube to make this cute frilled neck lizard from The Craft Train. Make an echidna grass head. Mother Natured shows you how to make this fun project. Create a simple koala bookmark for your favorite books. You can find our koala drawing tutorial for this cute bookmark here. Use newspaper to make this fun koala craft from I Heart Crafty Things. Find some paper plates to make this koala and joey craft from Danya Banya. Make Aboriginal clapping sticks with Laughing Kids Learn. We explored Aboriginal dot art with this fun art project. Explore Aboriginal symbols with these beautiful Aboriginal Dreamtime Story Stones from A Moment in Our World. Decorate a boomerang with dot art with this fun project from Kidz Activities. Make Australian Damper Bread with Laughing Kids Learn. Anzac Biscuits are a popular treat. Danya Banya shows you how to make them. Lamingtons are another popular sweet treat. 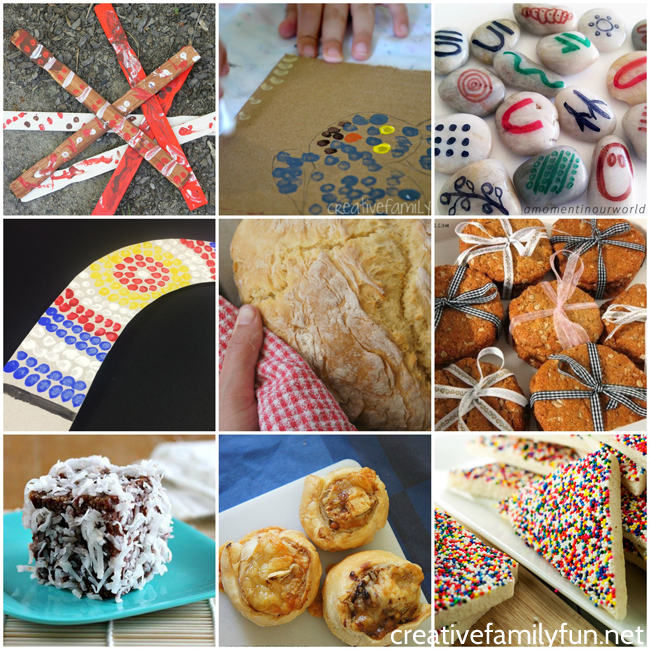 Create-Celebrate-Explore has an easy recipe for you to try. Enjoy a fun Australian recipe for lunch when you make these Vegemite and Cheese Scrolls from Laughing Kids Learn. Try fairy bread, a fun (and colorful) Australian kids’ treat. A Simple Pantry shows you how to make this simple treat. Grab a fun picture book written by an Australian author. Childhood 101 has a massive book list you should check out. Mem Fox is one of the most famous children’s book authors from Australia. Try one of her classics like Koala Lou or Possum Magic. Inspired by Over in the Meadow, Over in Australia by Marianne Berkes will take preschoolers on a fun exploration of Australian animals. I love to grab a book from the Discover the World series whenever we do a country exploration. D is for Down Under by Devin Scillian is full of facts and images of Australia. Australia ABCs: A Book About the People and Places of Australia by Sarah Heiman is another great book full of facts and images of Australia. 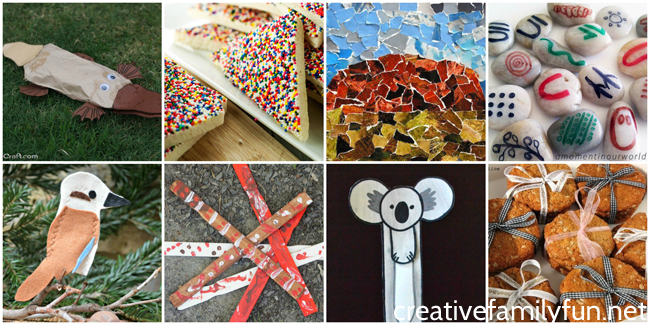 Have fun playing and learning with these fun Australia activities for kids!